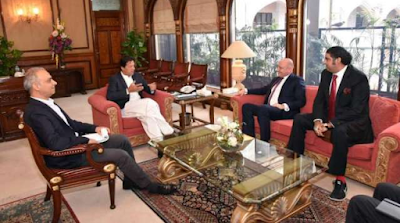 MOL Group Executive Vice President, Dr. Berislav Gaso, accompanied by MOL Group Regional Vice President Middle East Africa and Pakistan, Mr. Ali Murtaza Abbas, paid a courtesy call on the Honourable Prime Minister of Pakistan, Mr. Imran Khan. MOL Group has been operating in Pakistan since 1999 and is the single largest LPG producing facility in Pakistan, the second largest producer of Crude/Condensate in Pakistan, and the fifth largest producer of natural gas in the country. Dr. Gaso presented MOL Group and its global footprint, with a special emphasis on MOL Pakistan as a key player in MOL Group’s production portfolio to the honourable Prime Minister. Dr. Gaso expressed his interest in expanding MOL Group’s presence in Pakistan through a 3-rig operations in TAL Block, carrying out 2-D Seismic in the Margalla Block, carrying out 3-D Seismic in TAL Block worth USD 20 million and participating in the new licensing round for acquisition of new acreage, especially exploration and production assets in the country, particularly Greenfield acreage in Balochistan. There was also discussion on MOL Pakistan’s CSR activities including the intention of building a school and to carry out a tree plantation drive in MOL Pakistan’s areas of operation. Contribution towards the construction of shelter homes for the underprivileged and the homeless, towards the Premier’s initiatives for poverty alleviation. Dr. Gaso commented, ‘Pakistan is an important asset for MOL Group and we are happy to show our commitment towards developing the energy sector of the country. With our successful track record of 20 years, we look forward to many more in Pakistan’. MOL Group Regional Vice President Mr. Ali Murtaza Abbas said, ‘We are very pleased to be acknowledged by the Honourable Prime Minister of Pakistan for our 20 years in Pakistan and we look forward to growing our interests further in the country, reinforcing our commitment, as always’. PM Imran Khan commented, “I am fully aware of MOL Pakistan’s successful track record in the TAL Block, their CSR efforts in Khyber Pakhtunkhwa are unprecedented. I am especially appreciative of the hard work put in by Ali Murtaza Abbas and extended my support to the company for their further interest and investments in Pakistan”.